FULLY FEATURED MONITOR CONTROLLER FOR STUDIOS OF ALL SIZES. PRECISE, COMPACT & AFFORDABLE. There is one thing that should always be absolutely guaranteed - that you can rely on the accuracy of your monitor controller. 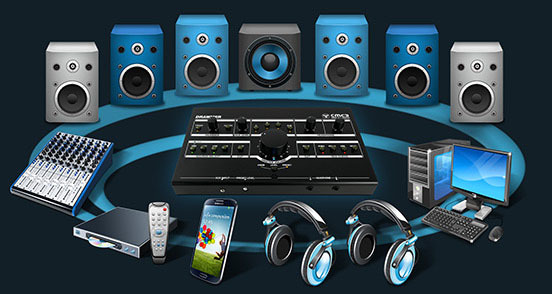 Can you trust the audio that your current monitor controller is providing? Is it colouring the sound? 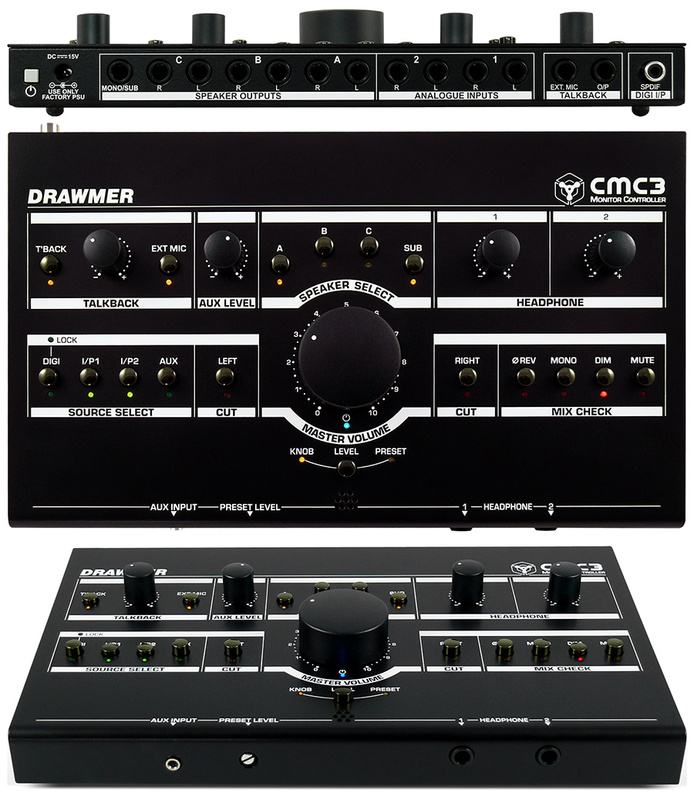 There are far to many monitor controllers available that do in one way or another - Drawmer monitor controllers do not flavour, colour, warm, improve or brighten the signal, the active circuit has been designed to faithfully produce the audio signal whilst removing many of the problems that a passive circuit will bring. For all Drawmer monitor controllers it is imperative that what you record is exactly what you hear. With the same Drawmer pedigree as the MC2.1, the CMC3 circuit is just as transparent and accurate. It has been designed to remove the limitations that a passive circuit brings, such as the ability to increase the volume for quiet passages and improved mix checking, without adding the artifacts that lesser quality active circuits introduce. The CMC3 supports 3 sets of stereo monitors, plus a dedicated mono speaker/sub-woofer output, each can be switched individually and simultaneously and in any order, especially useful for A/B comparisons. You can listen to multiple speakers with the same sub-woofer, or turn the sub-woofer off altogether. The volume control utilizes a parallelled custom quad pot for excellent channel matching and smooth feel, as does the secondary preset volume control on the front. This provides repeatable calibrated output level for the monitors, so that at the flick of a switch the engineer can hear the mix at the same predetermined volume, time after time, without having to meticulously adjust controls. 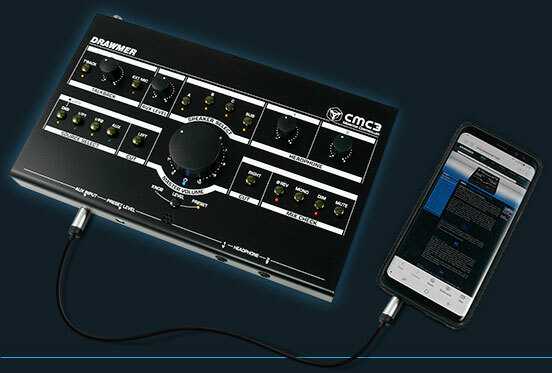 The CMC3 is very well connected with 4 stereo inputs in total: 1x SPDIF digital input (24 bit/192kHz), using the same DAC chipset as our established MC3.1 monitor controller, 2 stereo balanced jack inputs, plus a 3.5mm jack with variable level control for your Smartphone/MP3 Player. In addition, it has a 2 professional quality headphone outputs with a separate amplifier and level control, that provide the same audio quality and mix checking as the CMC3 does through the speakers. Talkback is also included with internal or external microphone, level control and audio routing to a dedicated mono output jack & headphones. The comprehensive mix checking facilities of the CMC3 include dim, mono, phase reverse, left and right cut as well as an easy access mute switch, allowing you to check the quality of your recordings: tune into your mix to hear any unwanted artefacts, test the effectiveness of the stereo mix, check for phase cancellation, listen to the stereo difference. Features that many monitor controllers lack. The CMC3 packs a lot of features into a small unit. The whole package is presented in a very low profile desktop enclosure of just 3.5cm high with a footprint of 27x16cm (10.5”x6.5”x1.4”). Whilst being smart and stylish the rugged, all steel enclosure will withstand the knocks and bumps of the studio, and, coupled with the high quality components used, the CMC3 is built to last. In addition, a Kensington security slot provides protection from thieves. Source switches can be active in any combination. 4 Inputs in Total - 1x Digital SPDIF (192 kHz / 24 Bit) & 2 on balanced analogue 1/4" jacks & 1 3.5mm Front Panel Aux jack for your Smartphone/MP3. 3x Speakers Plus a Mono Sub can be switched individually & simultaneously or give A/B comparisons. 2x Headphone Amplifiers with Individual Level Controls with easy access to the jacks on the front. Built In Talkback with Level Control, Internal or External Microphone, and Internal Routing to a Mono Output Jack & Headphones. 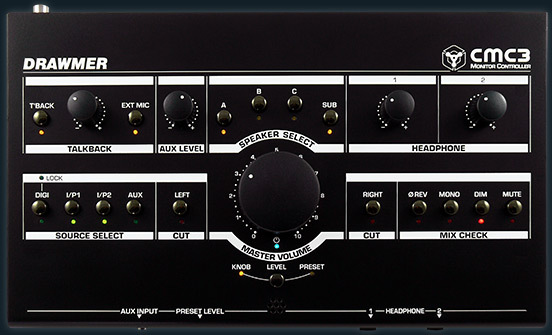 Comprehensive Mix Checking facilities Include Dim, Phase Reverse and Mono, Left and Right Cut as well as an easy access Mute switch.